The Austrian Jew David Roth was born in 1808 in Cassovia (now Košice in Slovakia, but then it was part of Hungary and as such within the Hapsburg Monarchy). At this time, anti-Semitism was particularly strong in the Hapsburg monarchy (e. g. Jews had to live outside the town), but the Roth family was the only Jewish family who had special permission to live within the town. David's father died when he was only 10. His mother Anna, who had a private income, stayed in town as renter and cook for the local kosher restaurant, serving itinerant merchants. It was a profitable establishment or else Anna Roth was clever enough to acquire patronage, possibly from the Jewish community, because all four of her sons studied in Vienna. At least two of them, David (1808-1885) and the the baby of the family, Mathias (1818–1891) (who in the late 1840s moved to Britain, where he stayed for the rest of his life), both became well known physicians and homeopaths. So in the middle 1820s the young David Roth left Cassovia to study medicine in Vienna. David became a product of the Jewish Enlightenment, being one of the young men who escaped the ghetto culture by embracing the study of the natural sciences. 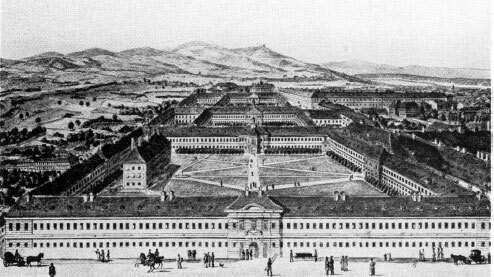 The Medical School in Vienna (see the lower image) was highly conservative and homeopathic medicine, commended by Samuel Hahnemann, was really not the flavor of the day. It was not authorized until nearly 1829. It was probably at that period that David Roth stood up for this new medical approach. In 1831, a terrible cholera epidemic struck Austria and Europe, just when Roth finished his studies, and he was sent to work in the rural district of Wieselburg (Mosonmagyarovar) and the estates of Count Zichy-Ferraris. There was panic in the towns. The Jews were accused of poisoning the wells. In Košice and the surrounding area (as in many other places in Europe) the cholera triggered violent riots. One of the town physicians was assaulted and very nearly killed. Only the arrival of the militia prevented the Jews being burnt at a stake already prepared. In the circumstances, one can understand why Roth, a young medical graduate, would decide to leave Austria for a somewhat gentler country. So in 1831 the young doctor emigrated to Paris, France, with a letter of recommendation from Count Zichy-Ferraris, who was Metternich's father-in-law, to Baron Rothschild, the Austrian ambassador in Paris. In Paris he became a well-known doctor of homeopathic medicine (under the name Didier Roth) for a rich Parisian clientele for more than 30 years (he treated personalities as Rothschild, Chopin and Heine). During the 1840s, he was staff physician to the Austrian Embassy in Paris. In France Roth published several medicine books—in 1832, he published his Health Instructions against Cholera Morbus. He said he had cared for a large number of patients there. Between 1836 and 1840, he published Homeopathic Clinic, an enormous compendium in nine volumes recording nearly 5000 clinical observations. His History of irresistible musculature or normal chorea earned him a medal from the Académie Nationale de Médecine in 1850. His talents for translation (he was fluent in Hungarian, English, French, German, and Yiddish) made him an unavoidable publisher of homeopathic thinking in Europe. It is unknown what was the primary reason for the reputable doctor to leave the homeopathic circle to invent calculating machines (see the calculating machines of Didier Roth). Most probably he was inspired by the French National Exposition (Exposition Nationale) of 1844. Between 1840 and 1844, Roth registered 6 patents—totaling 72 pages. At the Exposition Nationale in 1844, he presented several calculating machines as well as gas meters. He was awarded a bronze medal for his inventions. Dr Roth presented arithmetic machines which he had invented for the jury to examine; some intended only for the two first rules, the others, more complete, working multiplication and division as well; he also presented meters for steam machines and other similar devices. None of these machines is new in its intended purpose; but Dr Roth has solved these various problems by simple means worthy of interest. The jury awarded Dr Roth a bronze medal. Another famous inventor, who also presented several calculating machines was an outstanding figure in the industry of mechanical calculators—Thomas de Colmar. He only received a medal of encouragement. Roth certainly had been acquainted with the machines of de Colmar, as can be seen by the descriptive memo, serving as a prelude to his second patent of June 18, 1841. It seems that after the remarkable primary success of his calculating devices, Roth gave up mechanics and continued practicing homeopathic medicine for a rich clientele in Paris. Dr Roth was very passionate about art, and managed to build up a very beautiful collection of old engravings, notably by Dürer, which are now kept in the Bibliothèque Nationale in Paris. In 1860s he became an inescapable art consultant for the Rothschild family, whom he served as family physician. Artistically gifted, he prepared copper plates for bank notes that would have been less easily forged than those in circulation. He also designed clocks and various bronze ornaments. David Roth was married to Anne Nathalie Sassary, but had no children. He did have a stepson from Nathalie Sassary, who died in the 1870/1 revolution. Nathalie died in 1878. With age his sight deteriorated and at the end of his life David Roth became completely blind. His last years he spent as a recluse, still working on his art collection and playing the piano. This extraordinary man died in 1885 and was buried in the Montmartre cemetery in Paris, along his wife Nathalie and his stepson.